This is a reprint of the letter from the editor in Unwinnable Monthly Issue Seventy-Five, the Women Abroad issue. You can buy Issue Seventy-Five now, or purchase a one-month subscription to make sure you never miss an issue! Welcome to the inaugural issue of Unwinnable Monthly! This was a beast to put together, but we are jam packed with awesome stories and art for you. Over 100 pages! Let me show you around. Rather than just give you sixteen Unwinnable Weekly-style stories every month, I wanted to restructure and redesign the magazine from the ground up. Now, we have three distinct sections: Thoughts, Theme and Variation. Thoughts is made up of pool of regular writers and short features. These folks and departments will be with you, month in, month out, so let me introduce them to you. First off, the incredibly talented Melissa Graf is collaborating with me on Bestiary. I’ve wanted to do something like this for years – a kind of Monster Manual in installments, a short bit of verbiage on a creature accompanied by a beautiful illustration. The fearsome Nuckelavee of the Orkney Islands is our first subject. Fans of Matt Marrone’s journal of his adventures in gaming, popular culture and life in general will be relieved to find Rookie of the Year returns unchanged. This month, he checks out a driving monitor app called Automatic and learns he’s a terrible driver. You can join Gavin Craig every month as he plays through the old games in his sizeable, and titular, Backlog. This month, Gavin ponder the nature of the backlog itself. Eternal Darkness (god, I love that game) will be his first subject in February. HUD finds Andrea Ayres charting the intersection of games and politics. Ahead of the start of the 2016 Presidential election race, Andrea’s got a lengthy field guide of the Iowa Caucus. Turns out, the bonkers caucus system, and American presidential politics in general, has more than a little in common with Dungeons & Dragons. Here’s the Thing is Rob Rich’s column on whatever Rob Rich feels like talking about. Rob is a prolific pitcher on a dizzying number of subjects (you may recall his essay on Transformers toys back in Issue 73 and, to keep things incongruous, this month’s story is about Godzilla’s life advice) and I enjoy his writing so much that it just made sense to give him a spot all of his own to run wild in. Unwinnable is free form, after all! Long time Unwinnable contributor Richard Clark is back with a regular column called The Player’s Soul. As he explains in this month’s story, he plans to examine what the act of playing games does to us and how the ritual contained in many games forms a new kind of liturgy. Every month, we’ll also serve up a couple departments. The first is Artist Spotlight, in which we will profile the work of an artist we dig. Up this month is designer Brandon Elrod and his alternate movie posters. We also have some music and reading recommendations in the form of Reading List and Playlist. That’s where Thoughts stands so far. I’ve got a couple more regular columns cooking, and you might see more departments develop as time goes by and more ideas pop in our collective heads. 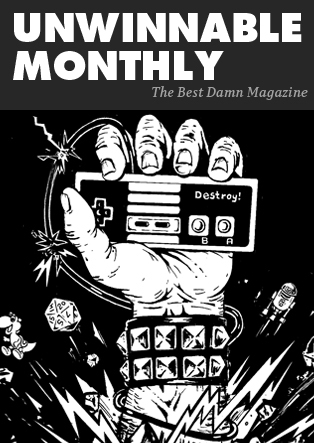 The big change for Unwinnable Monthly is the introduction of Theme. Some of my favorite Unwinnable stories were written for the Theme Weeks we put together a few years back – there is something very cool that happens when you get a bunch of talented writers riffing on the same subject – death, cities, RoboCop. They harmonize in unusual ways, reveal otherwise hidden nuances, surprises. We started warming this idea back up over the last few months, with issues dedicated to Metal Gear Solid and Star Wars. Now we’ll have the core of every Monthly dedicated to a theme. We kick things off with Women Abroad. Cara Ellison, recently returned from working around the world for a year and half, introduces us to the trials and tribulations of the vagabond life. Dina Abou Karam tells us how her life changed after moving from Lebanon to Japan. Hazel Monforton, a New Yorker living in England, writes about how Life is Strange reminds her of going home. Vikka Pérez-Puelles, a Venezuelan immigrant to the United States, discusses the differences between her adopted home and her troubled homeland. Krista Grothoff, an American living in both Germany and France, reveals how gaming has provided social circles that transcend language and kept her sane while living abroad. Finally, Elaine Reynolds charts the story of her game development career and reveals the subtle cultural differences between the Irish and the English that might otherwise go unnoticed. To finish us off, we have Variation, which is a potpourri of essays that are unconnected to the theme. Think of it as an issue of Unwinnable Weekly embedded inside Unwinnable Monthly. This month, we have Jackson Ryan’s examination of imagination and the psychological space games inhabit. Sophia Edwards explains how the PlayStation 4 Share Play feature changed her life. Carli Velocci argues that games are art and tech simultaneously, and how that is OK. Finally, I chat with Christina Parker of Cherry Pie Games about their upcoming game Emmerholt for the latest installment of our series of profiles on the winners of Unreal Dev Grants, sponsored by Epic Games. Variation will also expand as time goes on. When Gus Mastrapa’s Dungeon Crawler returns, you’ll find it here. We also have another serialized fiction in development, and some long form, regular essays. What I am actually saying is, even though this is a massive change from the Weekly, don’t expect Unwinnable to stop metamorphosing. Change is our constant. I really hope you dig this issue. A lot of folks worked extremely hard to get it to you. I would like to take a moment to thank all this issue’s contributors, as well as the Unwinnable editorial staff: James Fudge, Harry Rabinowitz, Jeremiah Cheney, Chuck Moran, Ken Lucas and Ian Gonzales, not to mention my super secret copy editors, my mom, Patricia Horvath, and my wife, Daisy De Coster. Also, many warm thanks to the folks who suggested we shift to a monthly format in the first place: L. Rhodes, Brian Taylor and David Wolinsky. If you enjoyed this issue, I would love it if you shared it with friends. Send them a copy (it is DRM free for a reason! ), encourage them to check out Unwinnable and subscribe, spread the word. You can help all these fantastic stories reach eyeballs beyond our reach. As always, if you have questions or comments, drop me a line at stuhorvath@unwinnable.com. Have a great January. See you around Valentine’s Day!